My body loves to transform yoga asanas into some sort of flowing, tai chi-ish dance. I have no idea why, but I simply cannot resist. I place my body in the iconic yoga shapes, I refine the pose, and then a few breaths later I'm rolling my spine or dropping a shoulder or wagging my tail. This feels very innocent and childlike to me, reminding me of swinging on the schoolyard jungle gym. It feels liberating, as if all the gunked up energy within is finally able to come out and play. It revitalizes me, and leaves me feeling fresh-faced and bright. I suppose this is some sort of beautiful dialog between my body and the pose, or more likely between the energy that pours through me and the universe beyond. Whatever it is, for me it is inevitable, and I'd like to share with you just how it rolls in my body, in case it inspires your body to flow and play, too. Here's one simple yoga flow that I practice every time I settle onto my mat. I like to call it Riding the Wave, and I often use it as an entry into my practice. It's simple, and it's likely that you've done it before. In its simplest incarnation, it is merely a slow and fluid dance between child's pose and cobra pose. Back and forth, again and again, following the breath and freeing up the spine until it feels like a smooth and graceful river. 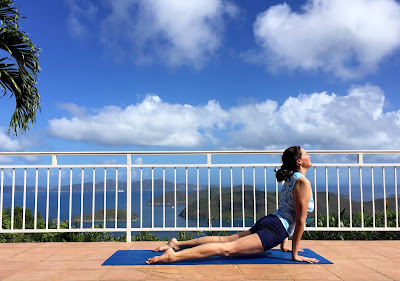 The flow can be amped up by transforming it into a flow from downward dog into upward dog, and it can be modified by keeping the elbows on the ground and shifting from puppy pose into sphinx. Are you game? Begin by resting in child's pose, breathing and settling and feeling the earth beneath you. (If you have sensitive knees, position a blanket so that your knees are supported but your hands and feet are on your mat.) Wait here for as long as it takes for an urge to rise up from deep within that calls you to move. When this happens, let your belly grow light as helium, carrying you gently up onto all fours. Let your tail drop as your light-as-air belly continues carrying you forward into cobra pose. Feel your long and graceful spine gently arc. (This exploration is less about extremes and more about inner exploration, so resist the temptation to strive for the "classic" form of the pose.) Root your hands into the ground and let the heart be light. Focus on all the details of careful alignment you've learned in class. Fill out the pose with energy and life. And when you're ready to move again, gently shift back into child's pose once again. Focus on quality of movement here, trying to iron out the wrinkles and move with as much fluidity and grace as possible. Invite your spine to think like a river. Shift back and forth between the extremes of child pose and cobra pose for as long as you like. After first moving slowly and clearly, feel free to free things up a bit, shaking loose the clear boundaries of the known pose. Shift forward from the belly, and then for the heart. Maybe from the head or the tail. Add a title diagonal movement by leading with one shoulder. Bend your arms or legs. Inject a little wildness by wiggling the hips or swishing the spine about in ways that feel interesting and soulful. You can even additional yoga poses into the mix. Slip dog pose in there so you have a triad of poses to melt through. Or add an upward dog or a plank pose or, if you're really feeling energized, a chatturanga dandasana or two. If you settle into a movement or rhythm that feels particularly satisfying, stay with it. Work your way into that kinked up hip or deadened shoulder. If you enjoy exploring the process of opening up the spine, spend some time articulating each vertebra of the spine as clearly as possible. When I do this, I try to transform my spine into that beautiful strand of pearls envisioned by yoga teacher Barbara Benagh, with each vertebra being its own pearl, and each pearl bound to the strand but capable of independent movement. I pick up my strand-of-pearls spine, one bead at a time, from the ground into bridge pose. And then I lower myself back down again, one bead after another, trying to sense each pearl as it releases back to the ground. This wavelike action of the spine sloughs of my dead bits and reawakens my sense of possibility. It also leaves me feeling smooth and soft once again. When you begin to tired of all this movement, return one last time to the simple, straight-on flow from child to cobra. And then settle back into child's pose until you feel the earth beneath you again. Breathe quietly and observe what has changed in your body and your mind. And, when you are ready, sit up on your heels, breath freely and smile.